Are These the Best Protein Cookies on Earth? Anyways, this year he gave up sweeteners so no chewing gum, no sucralose-sweetened protein powders, and no store-bought stevia (which I convinced him was too processed to be considered a ‘natural sweetener’). One of the hardest things about it, he told me, is not eating a ton of carbs. The guy eats like an animal and his sweet tooth is voracious, almost as voracious as mine! But he’s had to cut out all sweetened-protein powders from his diet which were what was stopping him from diving in to an ocean of carbs and sugary sweets. So I told him I would do my best to uploaded a few ‘sweetener-free’ recipes on here – recipes for sweet stuff using unflavored powders – so he can partake in the joy of lower-carb and nutrition-packed protein POW cooking. All my sweetener-less recipes, by the way, can be found on their special category if you go to the RECIPES BY CATEGORY page, here. 1. Mix all of the above ingredients in a box until you get a sort of oily dough. I mixed it all using a fork but really WORKED it so that the coconut butter combined well with the rest of the ingredients (you don’t want it to lump up). You can use a food processor for this job too. 2. Divide your mix into five small ‘balls’ and place them on a nonstick cookie pan (I used a silicone brownie pan for the job) or a pan lined with some baking parchment. Flatten then with a cookie stamp if you have one! I use these and they’re awesome. 3. Bake the cookies at 180 C (356 F) for about 15 minutes or until they brown all over. I cooked them for 20 and they kind of over-baked at the bottom so check on them after 15, ok? Now, here’s a REALLY important part: The cookies WILL BE SOFT when you take them out of the oven. Soft like you-won’t-be-able-to-pick-them-up-with-your hands soft. Let them cool completely though because, as they cool, they’ll harden up. This is because the coconut oil, which liquified when heated, sets as it cools and helps ‘solidify’ the cookies as it were. 4. Notice the crunch when you bite into the cookies. Notice the softness inside thme. Notice the way the flavors sing with one another. Smell the cookies, taste their the coconutty sweetness. And NOM!!!!! 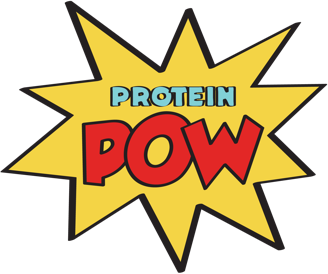 BY THE WAY, DO NOT FORGET TO SIGN UP TO THE PROTEIN POW NEWSLETTER! It’s out TOMORROW and it’s going to include some EPIC NEWS that you honestly CANNOT miss. Seriously. Sign up. Sign up by clicking here. Or on the button below to sign up to receive it! I have something crazy to share with you. Macros per cookie: 61kcals, 5g carbs (out of which 1g is fiber so net carbs: 4g), 3g protein and 3g fat. Note 1: I used this coconut sugar to make this. Coconut sugar is interesting. It’s has a low-glycemic index, a pretty decent macro profile, and it tastes really nice when baked. It’s not great eaten solo though – e.g. mixed into a pudding etc. At least I don’t particularly like it because it’s sweet, in a weird conutty way. BUT! Baked? It’s unbelieeeevable! And lends a fantastic crunchiness to cookies. Note 2: I recommend this unflavored pea protein powder if you’re in the UK and this one if you’re in the US – also from MyProtein! Remember, if you’re getting the one from MP, that you can use our special discount code POWMP to get 10% off your order. Note 3: If you’re in the UK, you can hey Baobab powder here. If you’re in the US, you can get it here. What is Baobab powder? It’s a superfood! It’s a superfood because it’s extremely nutritious. It’s high in antioxidants, vitamins and minerals. In fact, it boasts more magnesium and potassium than a banana! Check out this video below if you want to learn more about Baobab! The powder also tastes sweet and is absolutely delicious in these cookies.